(At left) from left, writer/producer Karen Sunderman and editor Steve Ash are immersed in the final editing process of "Working on the Railroad," a new WDSE documentary to air this week. Last week, editors and producers at WDSE Channel 8 had committed 1 1/2 years of their time and 250 hours of editing to one program. By Sunday, they will have spent even more hours piecing together "Working on the Railroad," a documentary that offers viewers a firsthand account of what it takes to run a railroad. 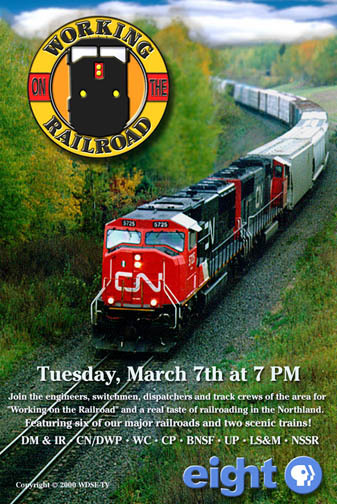 The documentary airs Tuesday at 7 p.m. on Channel 8 and again on Thursday, March 16, at 8:30 p.m.
With six major commercial railroads serving Duluth and Superior, Karen Sunderman, a WDSE writer and producer, wanted to know more about the industry that carries thousands of tons of grain, ore, coal and freight throughout the region every day. "It’s a story that should be done," Sunderman said. "It’s a big industry. It’s a visual industry, and it’s a big part of the Twin Ports." The main focus of the documentary is the people who keep the trains on track. Sunderman said there are few outside the railroad industry who understand the job of running a railroad. She said "Working on the Railroad" will allow viewers to live vicariously through the eyes of an engineer, a switchman, a dispatcher, mechanics and track welders. She learned that each job requires intense concentration and responsibility. 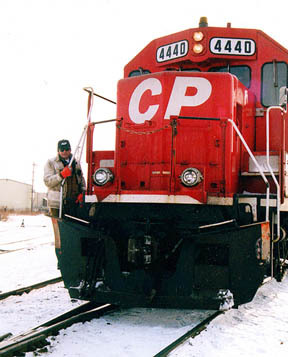 One railroad employee featured in the documentary is Bill Venne, who for 30 years has worked as the switchman for Canadian Pacific’s Duluth yard at Rice’s Point. Sunderman was able to walk alongside Venne as he did his job, something few people get to do. Sunderman learned that Venne, along with other railroad crews, take great pride in their work and the companies they work for. She was fascinated by the track crew, especially the welders who repaired tracks on site. Sunderman joked that railroad machinery looked like monsters in a horror movie. The driving force behind "Working on the Railroad" was curiosity, Sunderman said. This same force led the WDSE crew to create "Working Waterfront: A Harbor Portrait," a recent WDSE documentary featuring the ships and workers of Duluth’s waterfront. "I don’t know anything about these boats, but I sure see them," Sunderman said, about what compelled her to do the waterfront project. 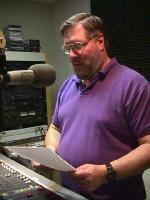 WDSE airs two regular shows, “Album” and “Venture North,” that feature stories about the region’s history and people. But a large production such as “Working on the Railroad” allows Sunderman to show people what is happening in the community now. Filming began in the fall of 1998, Sunderman said. Six videographers, each with a minimum of 10 years experience, shot 25 hours of film on excursions they took all over the region, including International Falls, Hibbing, Two Harbors and Eveleth, to name a few towns. Having that many videographers, or photographers, is unusual, Sunderman said. Also, the photographers did 80 to 90 percent of the interviewing because it was a tight fit in the engine room with one more person and a camera. Two photographers went on excursions at a time, though; one to shoot from an engineer’s point of view, and one to shoot the train’s exterior as it headed down the tracks. 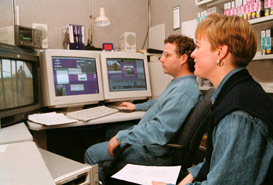 Once the taping and interviewing were done, producers had to write a script to match the scenes. Sunderman said she wrote 10 segments and Greg Grell, assistant producer, wrote two. “It’s like a quilt,” Sunderman said. Narration, pictures and music must all come together as a whole. Sunderman said editing those hours of video down to a 70-minute show is hard. Steve Ash, WDSE’s editor, said he has been consumed in the editing process since January. Once the documentary airs locally, more hours will be needed to edit the show down to 56 minutes so it can be offered nationally to other PBS programs. KTAC Channel 2 in the Twin Cities also plans to air the documentary. Sunderman said it’s a funny feeling when, after all the labor and excitement, the documentary becomes another videotape to put away on the shelf. While working on the documentary, Sunderman realized that it only scratches the surface of the railroad industry in northern Minnesota. Published in Budgeteer News, March 5, 2000.